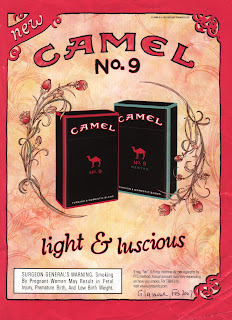 The advertising history of Camel cigarettes is a perfect case study in how to reach two demographics at once. Yesterday, R.J. Reynolds Tobacco said it will stop cigarette advertising in newspapers and consumer magazines next year, following protests that its Camel No. 9 ads targeted young teenage girls. Seems the ads, which ran in Glamour and Rolling Stone, had images of roses and lace and were a little too girlish. Now, we can’t say for certain whom Joe Camel was targeting, and Reynolds claimed it was adults 25-49. Wikipedia reports internal docs from tobacco execs show they had a long history of targeted the 14-24 age group, called “tomorrow’s cigarette business” — since most smokers get hooked by age 25. 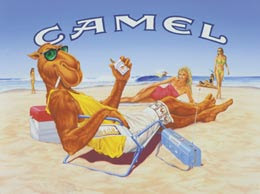 In one lawsuit against Reynolds, an attorney claimed Joe Camel ads boosted teen sales of Camels from $6 million to $476 million from 1988 to 1992. The No. 9 ads weren’t as aggressively youth-focused, but they did feature images of roses and lace … and ran in magazines such as Cosmopolitan, Vogue, and Glamour popular with teenage girls. Once again, critics said the ads really appealed to the younger demo. Reynolds has backed off by saying it won’t advertise in consumer print for at least a year. With TV, radio and outdoor also banned, now advertising will focus on direct mail and point of sale. We find this entire controversy interesting. Smoking is bad for your health, understood. But the product is legal and manufactured and sold while tobacco companies and health advocates argue about how much communication should be visible to the public. 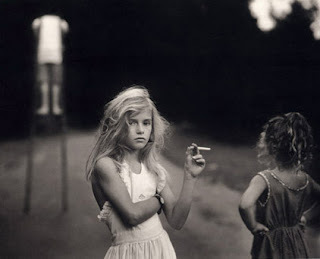 Perhaps it is time to end all tobacco advertising completely … because all the talk about partial shackles on media sure makes for good PR, and we bet today’s rebellious youth will notice all the smoke.